Why we need a backup software? Because we store data in a computer, make a backup is safer. What’s more, we can’t imagine when the machine will happen disaster, so if we create a system image before, we can restore to a normal situation quickly. Windows has a built-in backup program. Unfortunately, it has many limitations, if you can’t enter the system, you can’t use it. 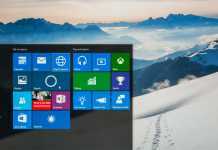 From Windows XP to the latest Windows 10, the inbuilt backup tools changed a lot. They are not simple upgrades but totally different, different version, different product. Users prefer looking for third-party professional backup software. There are lots of causes of data loss. The most common is a physical failure of your computer, human error, theft or disasters such as flooding, fires and lost coffee mugs! Data backup is just one of the essential facets of IT but is frequently overlooked. From ‘Backing up‘ you create a copy of your main files that can then be employed to revive them if the first document is missing, damaged or infected. In this article, we recommend you try AOMEI Backupper. Next, let’s have a look at this full-scale backup software. AOMEI Backupper is a free backup program that can handle backing up files and folders, hard drives, and even the system partition. The program user interface is most likely the simplest I’ve used in a backup software even though I’d think about AOMEI Backupper quite innovative. You see, the GUI is clear and user-friendly. 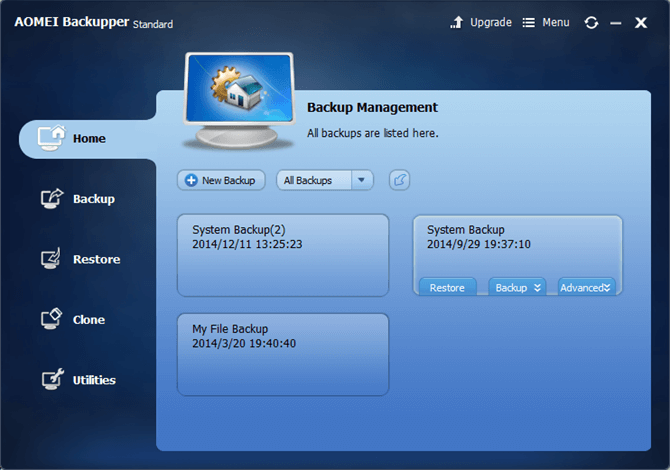 Unlike Windows backup program, the theme of AOMEI Backupper always the same – deep blue. There are five tabs on the left. When you open the utility program, the first interface is the Home window, which will show you backup tasks or empty. AOMEI Backupper has not only backup functions but also many other functions. About backup, from the Backup interface, you can see system backup, disk backup, partition backup, file backup and file sync. Then come to Restore, every backup type has a corresponding restore. And AOMEI Backupper supports universal restore, selective files restore, restore from bootable media, restore with partition alignment. AOMEI Backupper can be a clone software as well. When you plan to migrate OS to SSD, you need its cloning features. Following is a screenshot of AOMEI Backupper Standard’s Clone interface. 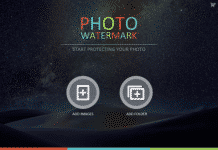 I take this edition as an example because it is a free backup software used by most people. Don’t worry about the System Clone, unlock it is very easy. In order to attract you to try it by yourself. I’d rather don’t tell you how to do in here. Backup, restore, and clone, all can be operated by command line. In fact. Some features in other backup software are paid while in AOMEI Backupper is free to use such as dissimilar hardware restore and event-triggered scheduling backups. AOMEI Backupper integrates several practical applications: Check Image, Explore Image, Create Bootable Media, Export/Import Configuration, PXE Boot Tool, View Log. AOMEI Backupper supports multiple languages. Its compatibility is very well. And it supports many storage devices. For example: backup to NAS, backup dynamic disk and so on. Moreover, it gets lots of rewards from famous and authority software websites. In a word, it is an excellent all-in-one backup software worth owning. 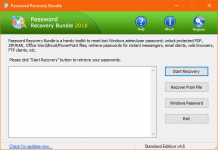 Whenever you don’t prefer to invest money on backup utility, you may use this freeware that has nearly all features of the Premium software.